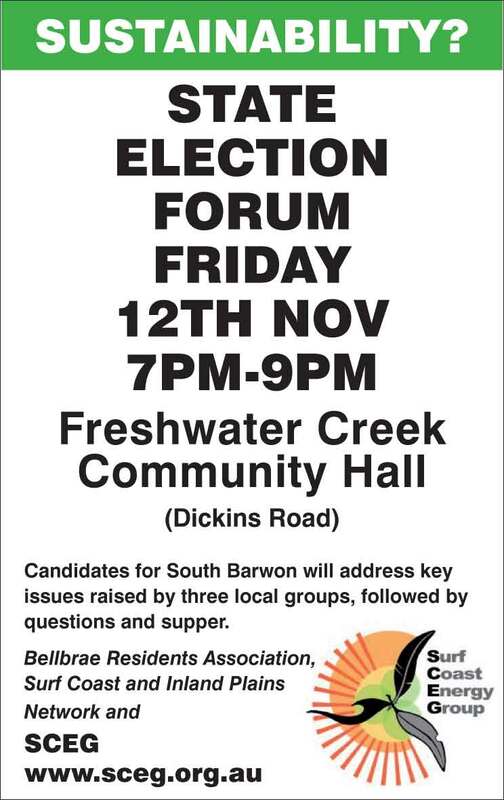 Please see flyer promoting the candidates forum for the Seat of South Barwon in the forthcoming State Election. Member for South Barwon, Michael Crutchfield, Liberal candidate Andrew Katos, and Green's candidate Simon Northeast will be attending. The program kicks off at 7:00pm. Candidates each have 15 minutes to speak to issues for the area. We've told them there should be a strong emphasis on environment (including climate change) and sustainabiility in their address. Questions will then be taken from the floor for 1 hour followed by refreshments.